A Frenchman accused of murdering four people at the Brussels Jewish Museum has told the trial he was "tricked". Mehdi Nemmouche is alleged to have shot dead two Israeli tourists, a volunteer worker and a receptionist in May 2014. He did not elaborate on his remark. Earlier in the trial his defence lawyers had claimed he had been caught up in a plot targeting Israeli intelligence agency Mossad. If convicted, he faces a life sentence. He denies all charges. "Ladies and gentlemen of the jury, I was tricked," said Nemmouche, who served a jail term in France and travelled to Syria before allegedly returning to Europe to carry out the anti-Semitic attack. Two witnesses in the trial have accused him of being an Islamic State torturer and jailer. He was giving his final testimony in a trial in which he has so far barely spoken since it started on 10 January. "My lawyer, (Sebastien) Courtoy, explained to you the reasons why I have been silent from the beginning," he added. He said this was not a "disrespectful attitude," and he "really didn't want to offend". "If I could change it, I would change everything," he said, without further clarification. Earlier in the trial, the Nemmouche defence team had claimed that the Israeli couple killed in the attack, Miriam and Emmanuel Riva, were intelligence agents assassinated by an unknown man. Prosecutor Yves Moreau said the defence arguments were "complete nonsense" and they should "stop the joking". 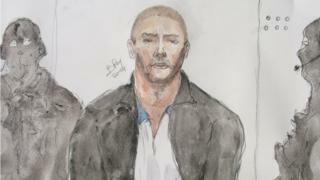 Another Frenchman, Nacer Bendrer, 30, is also on trial, accused of providing the weapons used in the shooting. He insists he has "nothing to do with this story" which has been a "nightmare". "I have a life waiting for me, a wife waiting for me," he told the trial. The jury is expected to give its verdict on Thursday.